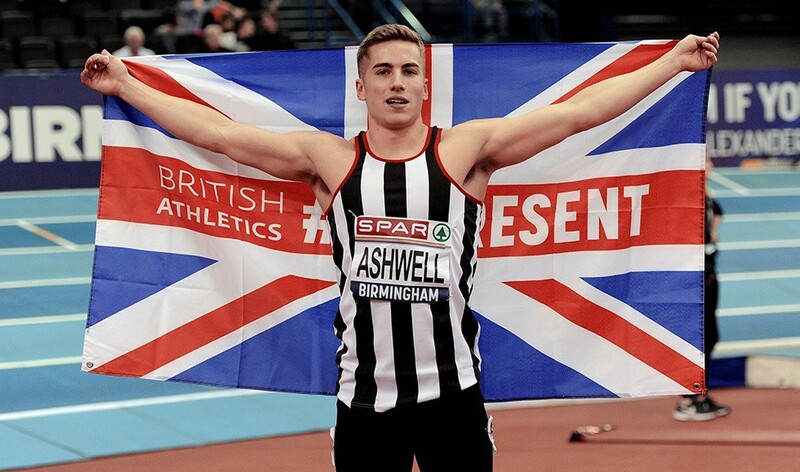 Dominic Ashwell sprang a real surprise at the Spar British Athletics Indoor Championships by taking the men’s 60m title on what was a very eventful opening day in Birmingham. Dwain Chambers’ decision to come out of retirement had brought added attention to the blue riband sprint in which double European indoor and former world indoor champion Richard Kilty and European 200m silver medallist Nethaneel Mitchell-Blake were expected to feature heavily, with places at Glasgow 2019 potentially up for grabs for the winner and runner-up. However, it became clear that things were not about to pan out as expected when Mitchell-Blake didn’t make it past the heats, coming fifth in the opener after a poor start. Chambers had progressed to the semis with an opening run of 6.78 but, not long after Nathan Gilbert had been disqualified for a false start, the same fate befell the European record-holder, who held his hands up immediately to admit his error. Bracknell’s Adam Thomas kept his cool to win that semi-final and progress with 6.63, fractionally outside the European indoor qualifying mark of 6.60, with Ashwell second in 6.67. Ojie Edoborun clocked 6.65 on his way to the final while Kilty qualified as a fastest loser with 6.71. But it was 19-year-old Ashwell, fifth in the 100m at last year’s World U20 Championships, who took his opportunity and clocked 6.64 as runner-up Thomas and third-placed Jeremiah Azu were both given a time of 6.66. Kilty, who underwent Achilles surgery last year, was sixth in 6.69. The Shaftesbury athlete, who will now target the qualifying standard to make sure of his place for Glasgow, said: “I would say it’s been a very good day to say the least, especially after the semi-final. “I think, to come into the final and produce that is just massive. I’m hoping to get the standard next week (at the Müller Indoor Grand Prix) but if not hopefully I’ll have another chance before the championships. That’s the goal. “It would be nice to make a senior team because it will help so much with that transition coming from an under-20 to a senior. Chambers is one of Ashwell’s idols and the former world and European indoor champion, who had retired in 2017, said: “These things happen but I had a blast. It’s great to be back. The rest of the men’s track action centred around progressing to the day two finals. There were personal bests galore in the qualifying races for the 400m, with Owen Smith winning the first semi-final in 46.85 – inside the European qualifying standard of 46.90 – and Cameron Chalmers qualifying second-fastest in winning the second semi when he produced a season’s best of 47.01. In the men’s 800m heats, Jamie Webb was fastest with a time of 1:48.81, Joseph Reid second-fastest with 1:49.15 and Guy Learmonth also comfortably through to the final after running 1:49.62. Birchfield’s Elliot Giles was fastest in the 1500m thanks to his heat two win in 3:47.62 ahead of Piers Copeland, while Neil Gourlay won the opening heat in 3:48.37, followed by fellow Scot Sol Sweeney in 3:48.43. The first champion of the weekend was crowned in the triple jump, when Newham’s Michael Puplampu saved his season’s best for last, leaping 16.28m to secure the title. The jump overtook the 16.27m mark set by long-time leader Nathan Douglas, who had been going for his eighth British title indoors and out but fouled his last attempt and had to settle for silver. Nathan Fox of Shaftesbury Barnet took bronze with 16.12m. “It’s been a long time since I was fully fit and it was six years ago today I competed at these championships well and it’s taken a long time to get back to fitness,” said Puplampu. Elsewhere in the field, high jump victory went to 2016 European medallist Chris Baker after his first-time clearance of 2.22m, with a height of 2.26m proving elusive. Highgate’s European under-18 champion Dominic Ogbechie won an impressive silver with a season’s best of 2.18m, with Tom Gale third after a 2.14m clearance. The day one action closed with the shot put competition, where Scott Lincoln’s fourth-round throw of 19.06m gave him a comfortable victory. Yousuf Zatat was second in 17.45m with Samuel Heawood third thanks to a throw of 16.38m. Find a women’s event report here.